AMRITSAR: In a terrible disaster, at least 61 people who among the crowd of hundreds had spilled onto railway tracks while watching burning of Ravana effigy were crushed to death by a speeding train here in Punjab on Friday, triggering anger in the area and nationwide outrage. Nearly 72 others were injured, many of them seriously. A large number of some 300 people were watching the huge Ravan effigy in flames amid exploding crackers while on the tracks at Joda Phatak near Dhobi Ghat within the city when the Jalandhar-Amritsar DMU passenger train coming to Amritsar from Hoshiarpur came hurtling down around 7 p.m. It took just about 10-15 seconds for the train to pass -- and leave behind a heap of crushed and dismembered bodies. The incident sent shock waves across the country, with President Ram Nath Kovind and Prime Minister Narendra Modi leading the condolences, even as Punjab Chief Minister Amarinder Singh ordered an inquiry into the incident and set up a crisis management group of his Cabinet colleagues. A state mourning has been declared in Punjab tomorrow, and all offices and educational institutions will remain closed in Punjab. Sub Divisional Magistrate Rajesh Sharma said 61 people, including women and children, have died and at least 72 injured have been admitted to Amritsar hospital. Opposition parties blamed the Congress-led state government for allowing Dussehra celebrations near the tracks, while the railway officials also sought to put the onus on local administration saying the national transporter did not give any permission for such an event. Raveen Thukral, media advisor to Chief Minister Amarinder Singh, said initial reports suggest the accident occurred during a stampede as people rushed towards the tracks when crackers burst during the burning of the Ravana effigy. The reports indicate that train crashed through the crowd on the tracks at that time, he added. A video showed people were run over by the train when they were watching the Ravana effigy burn, with many of them also seen filming the celebration. As the effigy was lit and the fireworks went off, a section of the crowd started retreating towards the tracks where a large number of people were standing to watch the event, officials said. However, two trains arrived from the opposite direction at the same time giving little time to people to escape, they said. Several people were mowed down by one of the trains. Wails and cries filled the air as friends and relatives frantically looked for their near and dear ones. Severed bodies, including of children, were lying at the site hours after the accident with angry people not allowing authorities to remove them. It was a heart-rending sight as the dismembered body parts laid strewn on the blood-soaked ground, and many were difficult to be identified, eyewitnesses said. People shouted slogans against former local MLA and wife of Punjab minister Navjot Singh Sidhu, Navjot Kaur Sidhu, who was present as chief guest during the event, alleging she left the venue after the accident. She, however, said she had left the place before the accident took place and rushed to the hospital the moment she came to know of it. She said the railways should have ensured that trains slow down near that section of the track during Dussehra celebrations. "Every year, Dussehra celebrations take place there," she said, as opposition parties raised questions about permission for holding the programme near the railway tracks. Amid the political bickering, all major parties, including the BJP, Congress and AAP, also asked their local party workers to help in relief work. There was shock and disbelief as panic-stricken people recounted the horror. "I have lost my minor child. I want him back," an inconsolable mother could be heard. Another said people could not hear the sound of the approaching train due to bursting of fire-crackers. Amritsar Police Commissioner S S Srivastava said there was a great rush because of the Dussehra celebrations and necessary action would be taken. A state mourning has been declared tomorrow, and all offices and educational institutions will remain closed in Punjab. Amarinder Singh ordered an inquiry into the incident and set up a crisis management group of his Cabinet colleagues. "I am at the moment not aware of the reasons for this Ravana effigy next to a railway station. The administration will look at it," he said. Singh, who was scheduled to leave for Israel this evening, has postponed his trip and will fly to Amritsar Saturday morning. He announced compensation of Rs five lakh for kin of each deceased and free treatment for the injured. Additional police forces have been rushed to the spot to control the situation. The incident sent shock waves across the country. There was an outpouring of grief with President Ram Nath Kovind, Prime Minister Narendra Modi, Punjab Governor V P Singh Badnore and several other leaders condoling the loss of lives. 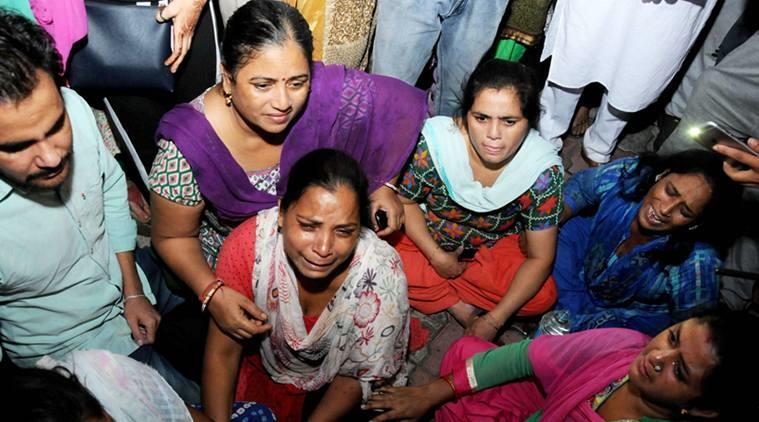 Modi announced Rs 2 lakh compensation for the family of the dead and Rs 50,000 for the injured. He also directed officials to provide immediate assistance. "Extremely saddened by the train accident in Amritsar. The tragedy is heart-wrenching," he tweeted. "My deepest condolences to the families of those who lost their loved ones and I pray that the injured recover quickly. Have asked officials to provide immediate assistance that is required," he said. Minister of State for Railways Manoj Sinha and top railway officials rushed to the spot while Railway Minister Piyush Goyal, who had gone to the US, has cancelled all his engagements there and is returning back. Former Chief Minister Parkash Singh Badal demanded an inquiry by a sitting high court judge to fix the responsibility and punish the guilty.